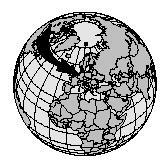 Germany is located in Western Europe. The topography of the country is varied, and includes regions of deep forest and high mountains, as well as a wide valley surrounding the Rhine, Germany's largest river. The highest mountain peak, the Zugspitze, lies on the border with Austria. Less than 3 percent of Germans are farmers, and the country must import much of its food. Apples, pears, cherries, and peaches, as well as grapes for wine production, are important crops in Germany. Food has always been a major part of German culture. Even the well-known German fairy tale, Hansel and Gretel, makes reference to food. Hansel and Gretel, brother and sister, discover a house in the forest made of gingerbread and candies. King Frederick II (King Frederick the Great, 1712–1786) introduced the potato, a staple in the German diet. He gave away seed potatoes and taught the people how to grow them. But wars caused food shortages and hardship twice during the twentieth century. After the Germans lost World War I (1914–18), food was scarce and soldiers trying to get home were starving. After World War II (1939–1945), the country had even less food available, but this time nations that had defeated Germany, including the United States, helped to feed the Germans and rebuild the country. 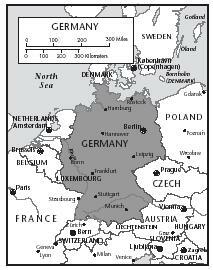 In 1949 after World War II, Germany was divided into East Germany and West Germany. This division caused the country's two halves to develop different styles of cooking. East Germany, closely associated with its neighbor, Russia, took on a more Russian style of cooking. West Germans continued the traditional German cuisine. Germany, similar to the northern and southern styles of cooking in the United States. In the north, restaurants in Hamburg and Berlin might feature aalsuppe (eel soup) or eintopf (seafood stew). Soups of dried beans, such as weisse bohnensuppe (white bean soup) are also popular. In the center of the country, menus include breads and cereals made with buckwheat and rye flour. A favorite dish is birnen, bohnen und speck (pears, green beans, and bacon). In the middle of the country, a region near the Netherlands known as Wesphalia is famous for spargel (asparagus), especially white asparagus, and rich, heavy pumpernickel bread. Westphalian ham, served with pungent mustard, is popular with Germans worldwide. 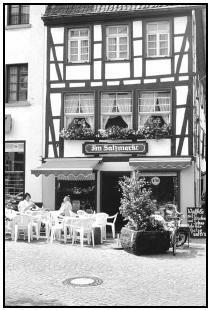 Frankfurt, located in the south, is the home of a sausage known as Wüstchen . This sausage is similar to the U.S. hot dog, sometimes called a "frankfurter" after the German city. In the south, a dish mysteriously called Himmel und erde (Heaven and Earth) combines potatoes and apples with onions and bacon. The southern region of Bavaria features rugged mountains and the famous Black Forest. Black Forest cherry cake and tortes, as well as Kirschwasser, a clear cherry brandy, are two contributions from this area. Spätzle (tiny dumplings) are the southern version of knödel (potato dumplings) of the north. Lebkuchen is a spicy cookie prepared especially during the Christmas season. East and West Germany were reunited in the early 1990s, but Germans continue to cook according to their region. Germans tend to eat heavy and hearty meals that include ample portions of meat and bread. Potatoes are the staple food, and each region has its own favorite ways of preparing them. Some Germans eat potatoes with pears, bacon, and beans. Others prepare a special stew called the Pichelsteiner, made with three kinds of meat and potatoes. Germans from the capital city of Berlin eat potatoes with bacon and spicy sausage. Sauerbraten is a large roast made of pork, beef, or veal that is popular throughout Germany, and is flavored in different ways depending on the region. In the Rhine River area, it is flavored with raisins, but is usually cooked with a variety of savory spices and vinegar. Fruit (instead of vegetables) is often combined with meat dishes to add a sweet and sour taste to the meal. Throughout Germany desserts made with apples are very popular. Knödel, or dumplings, accompany many meals, especially in the north. In the south, a tiny version called spätzle is more common. Knödel may be made either of mashed potatoes or bread (or a mixture of both), and are either boiled or fried. Germans enjoy bread with every meal, with rye, pumpernickel, and sourdough breads more common than white bread. Soft pretzels can be found almost anywhere. Spargel (asparagus) served with a sauce or in soup is popular in the spring. Rinse beans in a colander and remove any discolored or shriveled beans. Place beans in a large pot, cover with water, and leave to soak overnight. Drain beans in colander, rinse them, and return them to the pot. Measure 3 quarts of water (12 cups) into the pot. Heat the water to boiling, and then lower heat and simmer the beans, uncovered, for about 2 hours, until the beans are tender. Add parsley, onions, garlic, celery, and salt. Simmer for about one hour more. Add chopped ham, and heat for about 10 minutes more. Serve hot, accompanied by pumpernickel or rye bread or rolls. Sidewalk cafés are popular meeting places for kaffee (snack with coffee) in the afternoon. In a deep skillet, cook the bacon, drain most of the fat, and crumble into pieces. In the same skillet, fry the onion and garlic in the remaining bacon fat over medium-low heat until tender. Add the sauerkraut, potatoes, water, white grape (or apple) juice, brown sugar, bouillon, bay leaf, and caraway seed. Add enough water to cover potatoes and bring to a boil. Add the bratwurst to the mixture. Cover and simmer for 20 to 30 minutes. Add apple slices and simmer 5 to 10 more minutes. Peel the potatoes. Place them into a large pot and fill the pot with enough water to cover them. Bring the water to a boil, lower the heat, and simmer until the potatoes are soft (about 20–30 minutes). Drain the potatoes well in a colander, place them in a bowl, and mash them, using a hand mixer or potato masher. Add the egg yolks, cornstarch, breadcrumbs, salt, and pepper. Rinse out the pot and refill it with water and heat the water to boiling. While the water is heating, shape the potato mixture into golf-ball sized dumplings. Roll the dumplings in flour, and drop immediately into boiling water for 15 to 20 minutes. Serve with butter and salt. Makes about 2 dozen dumplings. In a large mixing bowl, dissolve yeast in warm water with 1½ teaspoons sugar. Add molasses, honey, shortening, salt, caraway seed, orange rind, and the rest of the sugar. Slowly add both types of flour to mixture and knead until smooth and elastic (about 10 minutes). Clean out the mixing bowl, butter it lightly, and return dough to bowl. Cover with plastic wrap and allow the dough to rise for 1 to 2 hours. Push a fist dipped in flour into the center of the dough. Turn dough out onto a floured countertop or cutting board and shape into a loaf. Transfer the loaf to a greased cookie sheet. Cover the dough with plastic wrap and allow it to rise again for 1 hour. Wash the asparagus and snap off the hard ends. Cook the asparagus in boiling, salted water for 7 to 10 minutes (until tender) and drain. Add cheese to butter and cook until melted and lightly browned. Serve asparagus topped with cheese sauce. Garnish with a sliced, hard-boiled egg. Combine the flour with 2 teaspoons sugar and salt and set aside. In a large bowl, beat eggs and milk together. Gradually add flour mixture to the eggs and milk, and beat until smooth. Melt ½ stick (¼ cup) butter in a saucepan. Add apple slices and cook gently until apples are softened. Mix 2 Tablespoons sugar and cinnamon together and stir gently into apples. In a 6-inch frying pan, melt 2 Tablespoons of butter. Pour in batter so that it is about ¼-inch deep. Cook until the bubbles on top of the batter burst and the pancake begins to set. Spoon about ¼ of the apples over the pancake and cover with more batter. Allow it to set, and then gently turn the pancake to brown it on the other side. Repeat to make 3 more pancakes. Dust with confectioners sugar and serve. Oktoberfest is the German festival of October. It is held, not in October but during the last week of September in Munich. In late summer or early fall in the United States, many cities stage Oktoberfests to celebrate German culture, especially German beer. At German Oktoberfests, beer is traditionally drunk from a large, decorated stone mug called a Bier Stein (beer stein). Germany has more than 1,200 breweries, making over 5,000 different kinds of beer. For Christmas, cut-out honey cakes called Lebkuchen are baked in squares, hearts, semicircles, or little bear shapes, iced, and decorated with tiny cutouts of cherubs (angels) and bells. One large or five to seven small cakes are then tied together with a bright ribbon and presented by a young lady to a young man of her choice on Christmas Day. Springerle (cookies), marzipan candies, and Stollen (a type of coffeecake with candied and dried fruit) are also popular Christmas desserts. To accompany the cookies, Germans drink Glühwein, a type of mulled wine. A favorite drink with teenagers is Apfelschörle, a sparkling fruit juice. A traditional Christmas dinner is roast goose with vegetables and Kartoffelknödeln (potato dumplings). After rolling out the dough, cut the lebkuchen into shapes such as hearts or teddy bears. If the cookies are to be hung by a ribbon, pierce one or two holes in the dough near the top of the cookie. Cream margarine and sugar together in a bowl. Add the egg and beat until fluffy. Roll out to ¼-inch thickness and cut into shapes, especially hearts. Decorate with white frosting and candies. Mix equal parts of apple juice and club soda in a tall drinking glass and serve. Slowly heat the apple juice and tea in a pan. Squeeze the juice from the lemon and orange, keeping the peels. Add the lemon and orange juices, sugar, peels, and spices to the pan and heat without boiling. Carefully strain the mixture through a sieve and serve. When eating out in Germany, it is polite to have both hands above the table at all times, but elbows should not rest on the table. It is also considered impolite to leave food on a plate. Waiters expect a 5 to 10 percent tip. An imbiss is a food stand that may serve bratwurst or other fast foods. Another type of restaurant is the bierhall, which commonly serves bratwursts, accompanied by beer. Making soft pretzels. After dividing the dough into twelve pieces, using very clean hands, roll each piece into a long rope (about 12 to 16 inches long). Making soft pretzels. Using a clean pastry brush, brush each pretzel with beaten egg and then sprinkle them with coarse salt. Making soft pretzels. Twist the ropes into pretzel shapes and place them on a greased cookie sheet. Making soft pretzels. The baked pretzels are best served warm, but they may be stored in a plastic bag or other airtight container for a few days. may have belegtes brot (literally covered bread), a small sandwich of meat or cheese, and a piece of fruit. Germans eat their big meal of the day, mittagessen, around noon or later, sometimes lasting two hours. The meal almost always begins with suppe (soup), and several more courses follow (see sample menu). In the afternoon, kaffee (snack with coffee) is often served, consisting of pastries and cakes. Abendbrot (supper, literally "bread of the evening") is a lighter meal than lunch, usually offering an open-faced sandwich of bread with cold cuts and cheese, eaten with a knife and fork, and perhaps some coleslaw or fruit. Pretzels and sweets may be enjoyed, especially by children, any time during the day. Dissolve sugar, salt, and yeast in warm water. Allow to stand for 3 to 4 minutes. Stir in 3 cups of flour. Add the last cup of flour, a little at a time, until a stiff dough forms. Sprinkle flour onto a cutting board or countertop and turn the dough out of the bowl. Using clean hands, knead the dough (fold it over, press down, turn). Repeat this process for about 7 or 8 minutes. Clean out the mixing bowl and coat the inside lightly with oil. Return the dough to the bowl, cover with plastic wrap, and leave the bowl in a warm place for 1 to 2 hours. During this time the dough will expand, or "rise" to about twice its size. Grease two cookie sheets and remove the plastic wrap from the bowl. Cover your fist with flour, and then punch down into the center of the dough. Turn the dough back out onto the floured counter and cut or tear it into about 12 equal pieces. Roll each piece into a long rope (about 12 to 16 inches long). Twist the ropes into pretzel shapes and place them on a greased cookie sheet. Using a clean pastry brush, brush each pretzel with beaten egg and then sprinkle them with coarse salt. Cover the cookie sheets loosely with plastic wrap and allow the pretzels to rise again for about 1 hour. Bake the pretzels for 10 to 15 minutes (until lightly browned). Serve immediately with spicy mustard. Makes about 1 dozen pretzels. Remove the tough outer leaves from the head of red cabbage. Cut the cabbage into quarters and slice away the tough core. Grate or chop the cabbage coarsely. Put the grated cabbage in a large bowl, sprinkle with salt, and add the chopped onions and slivered apples. Toss gently to combine. In a small bowl, combine the vinegar, sugar, and salad oil. Pour over the cabbage mixture, toss, and serve. Many Germans have begun to modify their eating habits to lower their calorie and cholesterol intake. Since the unification of East and West Germany in the 1990s, the government has faced the challenge of bringing the living conditions in the former East Germany up to the standard found in the former West Germany. Upgrading housing, schools, and utilities will continue after 2001. Despite unequal living conditions, Germans in all parts of the country are well nourished. In fact, most German children have enough to eat. Einhorn, Barbara. West German Food and Drink. New York: Bookwright Press, 1989. Hazelton, Nika Standen. The Cooking of Germany. New York: Time-Life Books, 1969. Hirst, Mike. Germany. Austin, TX: Raintree Steck-Vaughn, 2000. Loewen, Nancy. Food In Germany. Vero Beach: Rourke Publications, 1991. Parnell, Helga. Cooking the German Way. Minneapolis: Lerner Publications Company, 1988. Scharfenberg, Horst. The Cuisines of Germany: Regional Specialties and Traditional Home Cooking. New York: Poseidon Press, 1989. German Tourism. [Online] Available http://www.deutschland-tourismus.de (accessed January 31, 2001). Hansel and Gretel, prod. by Menahem Golan and Yoram Globus, and dir. by Len Talan, 84 min., Cannon Films, Inc., 1988, videocassette. im going to use the soft pretzels for my project. They look so delicious!!!!! Regarding the soft pretzels, to get a proper maillard reaction you need more alkaline than brushing with egg will provide. Between steps 14 and 15, drop the pretzels one at a time into a pan of simmering water holding 10 cups of water that has had 2/3 cup baking soda dissolved into it. Make sure they completely submerge and when they float back up remove them and place them back on the cookie sheet and allow to cool before brushing with the egg mixture. If a German like me reads about traditions of our country described in other places I just shake my head and wonder if the persons writing things like this ever have been here. You seem to have recherched about this but it is old traditioned stuff at all.